Lilly’s case is getting increasingly complicated. Every decision we make in consultation with our growing team of veterinary specialists has consequences. Each time we prioritize medical concerns, each time we add / increase / remove a medication, each time we choose to take action (or not), things — foreseen and unforeseen — result. It’s a true feat to pay attention to the small details and the big picture at the same time. It’s an even greater feat not to awake each day in a state of utter dread (assuming anyone here slept at all). Let’s not get bogged down in the finer details of what’s going wrong inside Lilly’s body. Let’s simply agree to accept that a full 22 months of treatment to protect Lilly from the brain and spinal cord inflammation (meningoencephalomyelitis) is taking a toll in interesting (and sometimes surprising) ways. I won’t lie. I sob, at least a little, every single day. At the same time that I pay extra attention to the darling reminders that the eternal (I hope) soul of my amazing canine friend remains inside a weakened body, I also mourn what Lilly’s life once was, and I fear what my life will be like after she is gone. 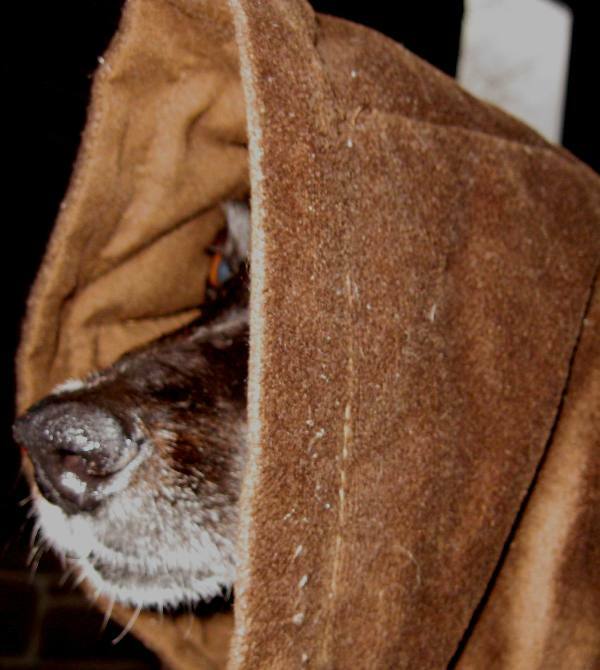 Cracking up when Lilly looks like a Jedi wrapped up in her blanket. Spending as much time as possible in the sunny spots in the house on cold days. I do not ride some sort of positive-thinking-fueled magic carpet. Oh, I’m grateful, but it doesn’t buoy me inside a bubble of bliss that lessens the pain. For better or worse (probably worse), I do everything I do not without grief but because moving through it, moving WITH it is the only way I know to stay upright until the end. There will NOT be a viral video of me dancing in the moments before Lilly’s death. That I can assure you. However, that does not mean we aren’t being brave. It simply means we’re being real about our journey together. 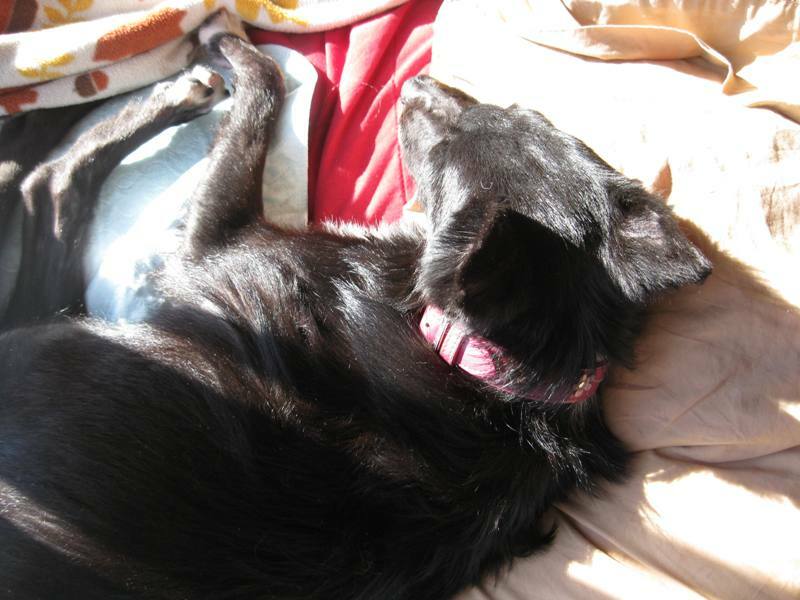 I am awfully sorry to come across this blog, I am so very sorry to hear about Lily’s problem with her rabies vaccine. I once had a dog with a similar problem, and I believe that any vaccine reaction can only be treated using a classically trained homeopathic vet, to change the enrgetics of the body. 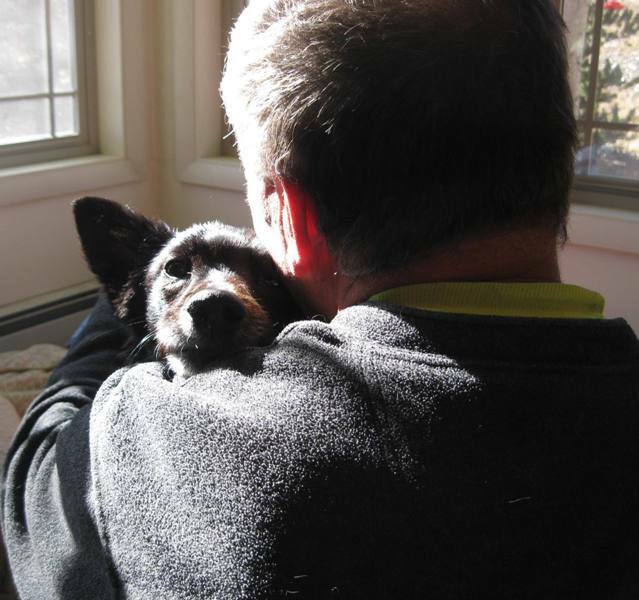 But even then, it’s an uphill battle – I fought it for 13 years with my girl. I now find that I have a young dog that has discomfort throughout her spine, and starting to have seizures caused by inflammation. I had refused to consider this before, didn’t want to go there, but now am thinking that this is due to her rabies vaccine, which was given at her withers. Who the heck does that anymore???? Thank you for putting this blog out there, and, from someone that has been there (my first girl died from a brain lesion of some sort), my best thoughts go out to you. Sending you lots of love and hugs, Rox. How well I know that mixture of emotions…tears, joy, love, and grief…all at the same time. It’s not easy, but there is honor in going through it with them. Hugs to the whole family. I can only imagine how hard it must be to continually evaluate every moment’s care for your precious girl. But in the end, you’re by her side. And as hard as it must be sometimes, you’re giving her a gift. Just like she has given you. Wishing you moments of grace.